Clothes Don’t Make the Runner, But They Sure Do Help! Last week we talked about finding the right running shoes, this week we’re talking about the right running clothes. 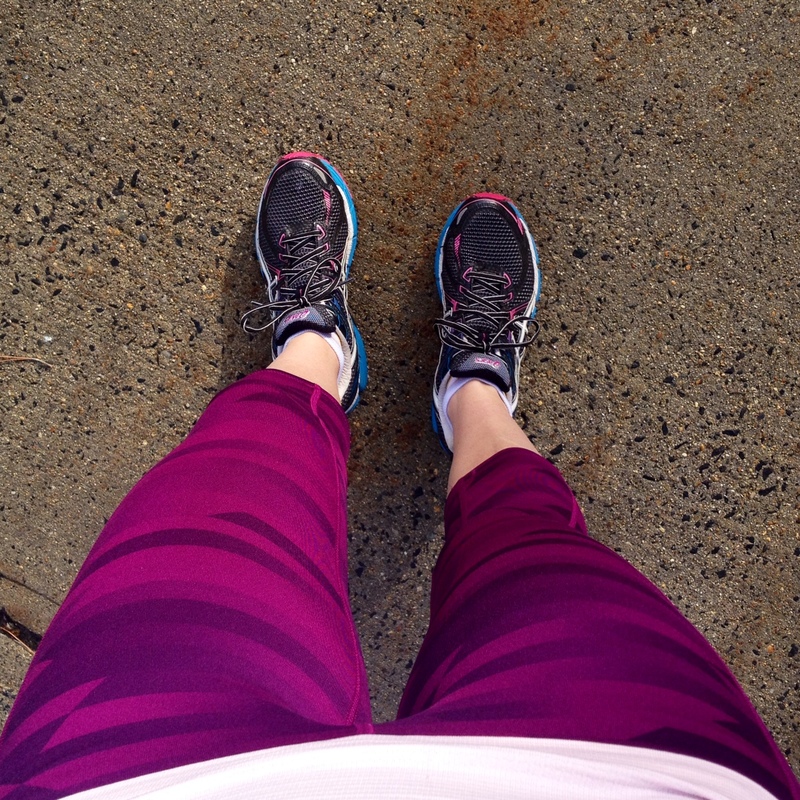 Sorry guys, but for this one I can only share my thoughts on women’s running apparel! Quick run through on the basics, we’ll keep this simple. You want to wear clothes that are well-fitting, nothing baggy that’s going to get in the way (and get really annoying) during your run. You can spend an arm and a leg on gear – but by no means do you have to! In terms of materials, aim for fabrics that are light in weight and don’t absorb a lot of moisture – for when you get really super sweaty caught in a rainstorm. When all else fails, wear something that makes you feel good. Never underestimate the motivation a new workout wardrobe can provide. Now on to the good stuff, brands. Let’s do some love/hate. Brands I love: lululemon, Old Navy Active, and Nike. Lululemon is a leader in the women’s athletic apparel market and sell clothes that not only work well, they’re super stylish too and have creative designs. Some favorites are the run: inspire crop II, the run: swiftly tech long sleeve, the energy bra, and of course the scuba hoodie. 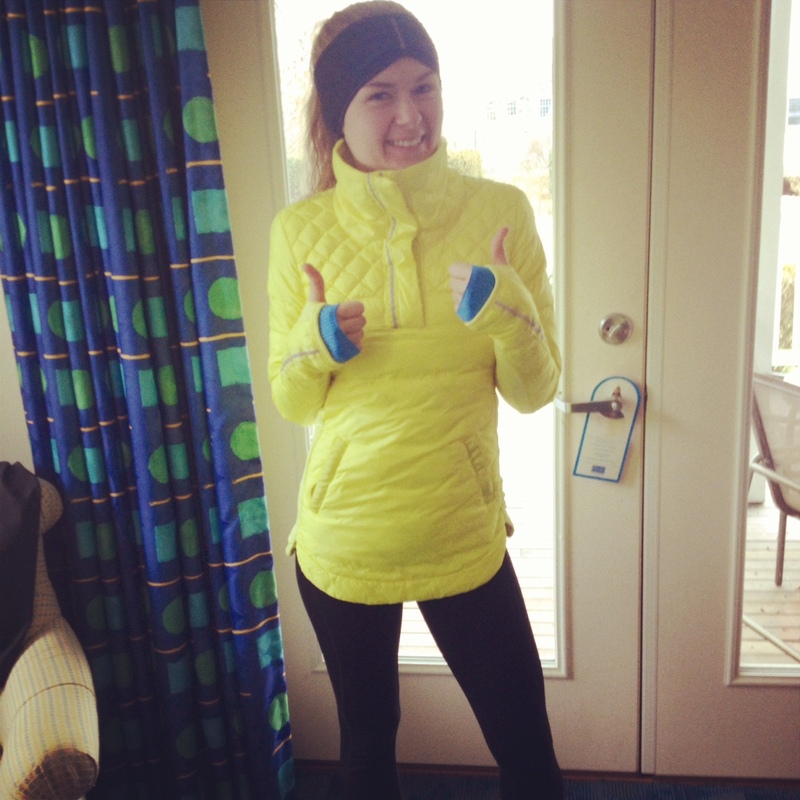 Also, their winter running gear is fantastic, bar none. The one downside to lululemon is their high-end prices. You’re getting top-notch quality, but you’re also going to have to pay a premium for it. Enter Old Navy’s Active line. Spring is starting to make a comeback (minus that snow storm many of us are getting this week) and with that many people are starting to add more miles to their training or starting to get into running for the first time. For that reason, I thought it’d be a good idea to talk about running shoes this week and running apparel next week. Do you agree? Super! Let’s do this. Check out those sneakers! Don’t worry, we’ll discuss these capris next week. Ok, I know I’ve been totally slacking in the blog department for a few months. For the most part it’s been the off season and things haven’t been that exciting. I did go to Martha’s Vineyard for a race and, shortly after, California where I got a serious dose of spring fever during morning runs in 50 degree weather. But all in all it’s been mostly routine gym sessions and maintenance-distance runs with a few yoga and barre classes mixed in between. But off-season no more! I’m struggling starting to transition back into training for my first half marathon of the year, the Boston’s Run to Remember held in Boston during Memorial Day weekend. I ran it for the first time last year and it quickly became my favorite half marathon for many reasons. I’ve never run the same half marathon more than once (except for that one time the Allstate Boston 13.1 half marathon fit perfectly into marathon training), so that should say something. Last year’s Run to Remember race was so well organized and was so meaningful. Not only does the race honor Massachusetts Law Enforcement Officers, but also last year’s race was additionally meaningful given the events that had taken place just over a month prior. Sean Collier had registered for the Run to Remember last year, and race officials made sure it did not go unnoticed. Each runner was given a special bib dedicated to him and there was a tribute at the start of the race. The kind of stuff that gives you goose bumps and reminds you why you run, and value the fact that you are able to run. If you’re in the Boston area on Memorial Day weekend, I highly recommend taking part in this race. Not only is the race well-managed and run along a great course, but the additional meaning behind the purpose of this race makes it worth it in itself. This past Friday a couple of friends and I escaped for a weekend trip to Martha’s Vineyard for the Martha’s Vineyard 20 Miler. Since I’m not marathon training I wasn’t really up for putting my legs through a full 20 miles, so I took advantage of this being the first year that a 2 person relay was offered. My friend Ashlee and I decided to take on the relay together and my friend Nichole (training for her 11th Boston Marathon) was going to do the full race. We took the ferry over to Martha’s Vineyard on Friday afternoon, where we learned just before boarding about the blizzard that was going to be coming in following day (aka race day). Usually the cape and islands get less snow than the rest of the state, but nope not the case for this storm! We were expected to get 8-12 inches of snow starting mid-day Saturday, making for quite an interesting race. When we arrived on the island Friday night Ashlee, Nichole, and I met up with a group of runners from the Somerville Road Runners club for dinner at the Black Dog Tavern. A quintessential New England dinner was long overdue and the Black Dog Tavern did not disappoint. We all had amazing meals, most of us got seafood, I had the bruschetta for an appetizer and ordered the scallops for my meal. So delicious! After dinner the three of us went from Vineyard Haven to Edgartown where we stayed at the Kelley House hotel. I honestly booked the Kelley House because it was the only place I could find a hotel room (the island gets packed with runners!) but the three of us agreed that we LOVED this hotel. First off, there are homemade chocolate chip cookies and cold milk served in the lobby each night, so that was a “must” when we checked in. Our hotel room was perfect, with a super comfy pullout couch in the living room, a kitchenette, full bathroom, big bedroom, plus a porch outside. Once we got settled in our room we all immediately passed out, we needed our rest for race day! The next morning we went out in search of coffee and breakfast, the race had an 11:00am start time so we didn’t have to rush which was really really nice. We found this cute little coffee shop called Espresso Love where I ordered a piece of toast with peanut butter and a cup of coffee. The weather was cloudy and cold around 35 degrees. Not nearly as cold as I expected so for the race I opted to wear my Old Navy Active compression capris, lululemon run swiftly tech long sleeve, lululemon what the fluff pullover, and my lululemon ear warmers. I have been loving The Skimm for months now. It’s a daily email with bit-size but informative pieces of what’s going on in the world that you should know about. Get the news in a fraction of the time, yes please! The Lorna Jane blog, I feel like I can spend hours on this site, there’s so much great content and inspiration. I haven’t tried out Lorna Jane clothing yet but I really feel like I should. Starbucks’ new caramel flan latte. Ok, I haven’t had this yet but I just might have one today for a Friday treat. Specialty lattes from Starbucks are outrageously high in sugar, but I think I need to make an exception. This ITB video demonstrating exercises to strengthen muscles if you’re having ITB issues. I’ve been through physical therapy twice now for ITB (lucky me) and almost all of these exercises were prescribed to me daily. As always, everyone has their own methods and unique muscle imbalances, so listen to your body first and foremost if you try these exercises out. This preview for Muppets Most Wanted which aired during the Golden Globes on Sunday. It still makes me laugh, stellar marketing. I HAVE to see this movie now. Have plans to watch football this weekend? There are some pretty high-stakes games scheduled from what I hear. Jessica from How Sweet It Is has got you covered on all of the best football food recipes. Last Thursday I went to my first barre class. Have you guys ever done this type of workout before? I had been thinking about trying out barre after hearing rave reviews from a couple of friends. It seemed ideal for me because it’s focused on small isometric movements that tone your muscles using ballet-inspired techniques. I’ve had my share of IT band issues from running in the past so I try to keep my leg muscles in good shape, and if I can do that while living out my ballerina dreams? I’m in! I can’t remember a time when I’ve looked back throughout one particular year and thought to myself, “Wow. This year is the one to beat.” But 2013 has been that year for me. Both from a running and personal perspective, I’ve worked hard to make some moves and it still sort of blows my mind that it all happened in the past 12 months.